As a SF Bay Area folks only special, I’m offering a 50 minute career search, brainstorming or business development strategy session for only $50. The details: I’m offering 50 minutes of focused, brainstorming or one-on-one networking strategy coaching (for job search or biz lead gen) as well as connections/introductions on a personalized and via a CASH-only or pre-paid via PayPal basis. Email me to set up a time for a CASH-only appointment or to book a time slot via credit card/PayPal, please PAY IN ADVANCE (non-refundable if less than 24 hours notice of cancellation, otherwise, 50% refund) – by JUST CLICKING HERE. and be sure to include your name, email, cell phone number, and your top 3 Pacific time slot choices. After you’ve paid for a slot(s) via PayPal, I will be automatically notified, but you still need to send your desired time slots and contact info asap. How do I add a Company Profile on LinkedIn? Only current employees are eligible to create a company profile. In order to create a Company Profile, you would need to provide a registered, company-owned email domain. This unique domain name would appear in all company employee email addresses following the “@” symbol (e.g., tsmith@companyname.com). Common email domains such as yahoo.com, gmail.com, hotmail.com or others cannot be used in the creation process of a Company Profile because they are not unique to an individual company. The requirement of a unique domain name also supports an authentication process built into the feature that allows authenticated company employees to edit the Company Profile information in order to keep it current. Click on “Companies” found under “More” in the top navigation bar of your home page. Click on the “Add a Company” link found in the upper right area of the page. Type in your company’s official name and your email address at the company on the “Company Name and Email” page. If your email address is already tied to an email domain for an existing Company Profile, you will be prompted to click on the existing Company name to edit the Profile. If your company email address is not a confirmed email address on your LinkedIn account, a confirmation email will be sent to the company email address. The email text will give you a link to log in to your LinkedIn account. 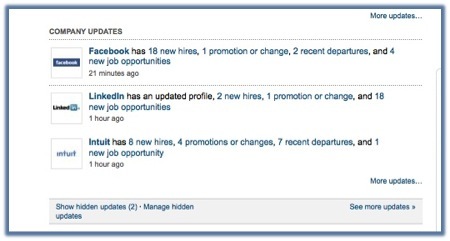 Be sure to log in to LinkedIn with your current primary email address. This will confirm your email address and add the email address to your account. If your email address is confirmed, you will be taken to the “Create a Company” page that will allow you to enter information about your company. Click on “Create a Company” once you have completed the required fields. If you do not have a registered company owned email address to create a Company Profile you may still create a group to promote your business. Maybe it’s the many years I spent in market research and/or business intelligence that made me so data driven, but I rarely react to anything without doing some research first. Where do I start? I use LinkedIn to conduct research on almost everything and everyone. Whether it’s a new prospective client, someone I met at a networking event, a highly recommended recruiter, a company I never heard of, or a potential new hiring manager, my go-to place is more often than not LinkedIn. Sure you can Google folks or companies as well, but I save a lot of time, and gain many more insights, by going to LinkedIn first. I even use LinkedIn’s Answers feature to search for information/answers on topics I am already curious about because in many cases the question and corresponding answers are already in there. And yes, you’ll usually have to sort through plenty of thinly disguised self-promotional answers (I always prefer when people just admit doing this), but you will find some intelligent responses from all types of experts on LinkedIn, and it’s definitely worth your time to do a quick search there. As a marketer, executive, sales type or talent acquisition pro, it’s always important to know your competition. Well, the same thing applies to your job search. How can you do easily do this? Start “following” the company of your dreams on LinkedIn (they need to have created a Company Profile though), and then, if you do receive that dreaded phone call or email from your point of contact informing you that, “They went in another direction,” or “You weren’t viewed as an ideal fit,” or “We’re putting the position on hold,” just head on over to LinkedIn in the next week or so and see who they hired instead. Why do this to yourself? Because you can use this type of intel to identify the skills you may be lacking, and can then go develop them (take a class, volunteer to work for free to learn, etc. ), or, if you want to look for different position within the same company, you can even learn more about the types of folks they view as ideal for their culture. Above is a screen shot of what I now see in my Network Activity feed on LinkedIn as a result of following a few of my “worth following” companies with profiles. Have fun with this handy new feature! I’m proud to say that this list describes me pretty darn well…too bad the opportunity that corresponds to it is in SoCal….sorry John! Seasoned business professional with a solid grounding in marketing, sales, business development, partnerships, negotiations, strategy, problem solving and business intelligence with a minimum of 10 years of client relationship management experience. Entrepreneurial: Highly motivated, imaginative, and resourceful; a self-starter. Aggressive: Embraces challenge; a reasoned risk-taker. Highly-Confident: A persona developed over time by consistent over-achievement. This attribute reflects the substance of the individual that attracts the trust of both client and colleague versus any sense of arrogance. Highly-Competent: An expert in relationship management with a core competency of marketing; intelligently effective cross marketer of other products. Ability to identify a qualified client’s needs and introduce the appropriate supporting professional(s) to address the situation. Knowledge of marketing disciplines and tactics including social media, interactive/online, traditional, affiliates and co-op. Ability to set and meet corporate and new business objectives. A working knowledge of local markets. An ambitious and fairly competitive individual who thrives in a team environment. High personal standards of ethics and integrity. Was working with my pal Stan at Sbux yesterday when he shared that a friend/new acquaintance of his is working on Divvy here in Seattle. The site’s just a landing page right now, but since I’d heard about the concept for the site when I was doing some biz dev strategy contract work with Paladin Partners this summer, I was intrigued to hear what they were up to at this point. He shared that one of the challenges currently being researched involved how they’ll deal with damage to items that get borrowed or shared. I thought for a minute and then offered that they should look at and/or contact another local Seattle start-up called Bag, Borrow or Steal to see what they’ve learned about it. One of the really great things about the Seattle startup scene is that people are fairly willing to share lessons learned and such. Hope Stan passes my suggestion onto his contact at Divvy and that anyone else reading this thinks about reaching out to those that have gone before you too.